C. Naevius Balbus. was one of the moneyers of the year 79 BC. He is not otherwise known. 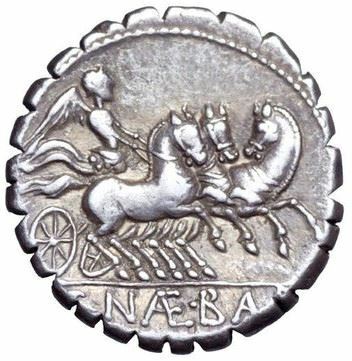 Gens Naevia, occasionally written Navia, was a plebeian or patrician family at Rome. Members of this gens are first mentioned at the time of the Second Punic War, but the first of the Naevii to obtain the consulship was Lucius Naevius Surdinus, in AD 30. In the time of the Republic, the principal cognomina of the Naevii were Balbus and Matho. Balbus, a common surname, originally signified one who stammers. Chase regarded Matho as a borrowing of the Greek Μαθων.